Enjoy an all encompassing LED ceiling fixture that provides a clean style with the modern touch of LED technology. 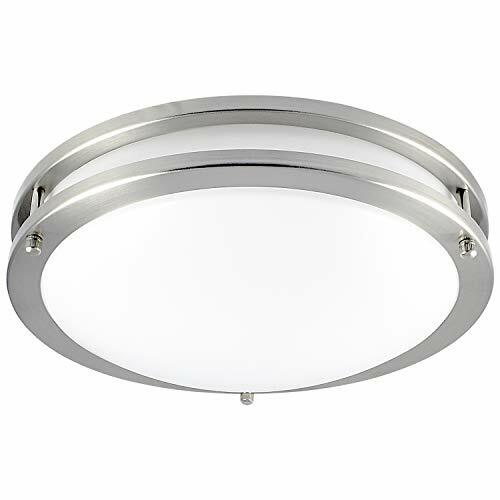 These Twin Ring LED ceiling fixtures feature a frosted acrylic cover and a beautiful chrome finish that is sure to compliment your home or living space. Each fixture is EnergyStar qualified and ETL Listed for your safety, so you know you are getting the best in energy efficient lighting. No longer worry about the cost of your electricity bill or how often you will need to buy new lights for your home or work space. Compared to a normal light fixture, you can instantly save your energy consumption with only 18W of power. Not only will you use less power but these LED flushmount fixture lights are more reliable and reduce your re-lamp frequency by having a 50,000 hour lifetime! That’s equivalent to 45.7 years when used for only 3 hrs/day. The standard ceiling light fixture only offers a 12,000 hour lifetime, which makes our LED ceiling fixtures more than 4x longer lasting! EASY INSTALL - No hassle installation with a flush mount light fixture which can be set up in a few easy steps! Just follow the installation guide to connect the wiring on the back of the LED light fixture and screw the light fixture in using the supplied screws and you are all done! BUILT IN LED - Each LED ceiling light comes integrated with 32 LED chips to provide bright, vivid light and have a long lasting life of 50,000 hours. You won't have to think about replacing or buying light bulbs for the next 45 years! DIMMABLE - Control the brightness of your flushmount LED ceiling light with the ability to reduce from 100-5% lighting output. Set your flush mount LED lights according to your mood and take delight in a pleasant atmosphere every time. CONTINUOUS LIGHT - Enjoy 1380 lumens of crisp, quality lighting that is perfect for any atmosphere and brighter than your standard flushmount lighting. Provide more light to your kitchen, closet, bathroom, bedroom, laundry room, entryway, hallway, or any area of your home or office! RELIABLE LIGHTING - Zero flickering light, zero delay, and zero worries with modern LED ceiling lights that provides high quality lighting. Each LED flushmount ceiling light features a brushed chrome finish, comes Energy Star & ETL listed for your safety, damp location rated for reliability, 120v hardwired, and backed by a 5 year warranty.